Attukal Bhagavathy Temple is one of the ancient temples of South India. It is popularly described as 'Sabarimala of the Women,' as women form the major part of the devotees. 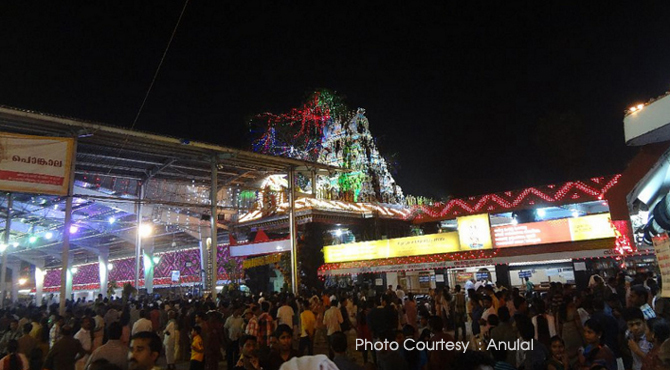 The temple is situated just 2 Km from the main city center of Thiruvananthapuram, the capital of the state of Kerala. Pongala, held on the ninth day of the ten-day-long festival, is the most important ritual of the temple. Only women are allowed to participate in this custom. The Festival is held in the month of february/March. Every year more than a million women from different parts of India and world gather at the temple premises and in the temple vicinity to offer Pongala to Attukal Amma. Usually, the queue stretched to almost 15 square kilometers in and around the temple. Even the premises of Churches and Mosques are being used for the Pongala as a great gesture of religious harmony. The people from other communities offer all facilities to the women devotees arriving State capital from distant places including neighbouring states during this festival every year. Devotees who gather to offer Pongala to Attukal devi increases in numbers every year. Attukal Ponkala, the largest annual gathering of women devotees in the world. The temple and its main festival also find place in Guinness Book of World Records for the highest attendance of women on February 23, 1997. 1.5 million women had participated in that year's Pongala. There is a legend behind this festival. Attukal is said to be one of the places where Goddess Attukalamma, believed to be the incarnation of 'Kannaki', (heroine of 'Silappathikaram' by Tamil Poet Illango in the 2nd century A.D) took rest on he journey northward from Madurai to Kodungallur. 'Pongala' means to boil over, and it refers to the customary offering of things which pleases the goddess. Devotees from all walks of life, irrespective of their social status, religion and cast, throng the temple to offer the 'pongala'- a sweet rice, prepared in earthen pots with rice, jaggery and coconut, to the Goddess. From temple grounds to courtyards of houses, to bus station and railway station to public roads one can see thousands of devotees offering Pongala to Attukal Devi. Festivities start with rendering songs about the deity. On the ninth day thousands of women gather in the temple to prepare Pongala. The rituals usually starts around 10.45 a.m. The rituals began with Tantri handing over the holy fire from the sanctum sanctorum to Chief Priest. He then lit the hearths at ''Kochu Thidapalli'' and ''Valia Tidapalli'' inside the temple. After this the 'pandara aduppu' was lit (the main Pongala hearth), marking the beginning of the holy Pongala. The fire, the priest lights is then passed on to the stoves of women who line up on either side of the roads. He then arrives with the Goddess’s sword and blesses the ladies by sprinkling holy water and showering flowers. he ceremony concludes at around 2.30 PM. The ladies take this blessed Pongala back to their houses. It is widely believed that the Goddess Bhagawati can make your wishes come true if you participate in this festival and the women do the rituals for health and prosperity of their families.